I love today’s inspiration picture. Jenn had sent it to me a while ago. I picked the colors and the silhouette look from this challenge. The card base is a 5 1/2″ x 6″ piece of Bashful Blue cardstock folded in half to make a 3″ x 5 1/2″ card base. One of the border stamps from Beautiful Borders was stamped in Chocolate Chip on a 1 1/4″ x 5 1/2″ piece of Whisper White cardstock. It was overlayed with a transparency strip of the same size. I taped them together on the top of the strips and paper pierced the bottom edge. You can’t see the acetate layer on the picture, but it makes the stamped strip shiny and add more resemblance to the glasses. I added a Chocolate Strip underneath both layers. That bottom of that layer was punched with the Scallop Edge Punch. The layers were adhered to the bottom half of the card base and tied Chocolate Chip Taffeta Ribbon on the upper edge of the layers. The sentiment was stamped in Chocolate Chip on Whisper White cardstock and punched out with the small oval punch. It was layered on half of a 1 3/8″ bashful blue circle and half of a chocolate scallop circle. I added a paper pierced border underneath the sentiment. These layers were adhered to the top right of the strip. I used a modified version of the WSC8 layout. My little flower was punched out with the Three for you Punch out of Bashful Blue cardstock. The edges were sponged with a sponge dauber and Bashful Blue. A 1/4″ Whisper White circle was added in it’s center and topped with a brown brad. The flower was adhered with dimensionals. I really like the transparency idea! I also like the idea of using a wheel as the main image. Very cool card, Beate! Simply beautiful – Beate!!! I love this new Set too!!! Awesome color contrast … and a great idea to use this gorgeous wheel! 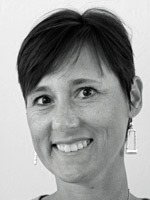 Love your challenge card, Beate! I love the border stamped in chocolate. I bet it really looks nice with the tranparency. and the little flower punch is awesome! Your inspiration card is so beautiful!! I love the colors and pretty images!! I also love how you’ve used acetate, and did your sentiment!! Wonderful as always!! That border stamp is beautiful and I love the way those colors look! Really beautiful card! This is so pretty! Very peaceful! Absolutely BEAUTIFUL, Beate! 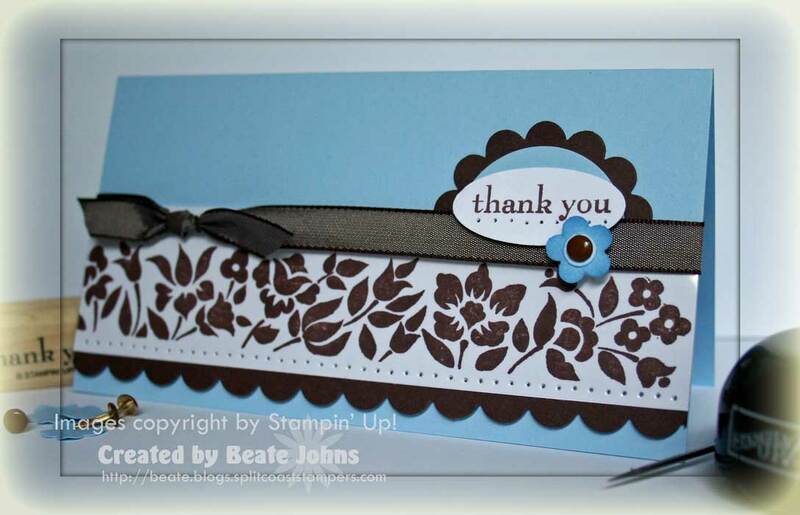 LOVE that border and the way you layered the oval punch on the scallop. . .adorable! This is beautiful, Beate! I love that borders set. I still haven’t inked mine up yet. Your card is truly inspiration for me! Love it!! Your cards are always so beautiful. Beautiful Beate!! Love the colours you chose to use…pretty! I missed last weeks BIC but I won’t be missing this week…plan to work on it tonight! Thanks! Just LOVE the colors Beate and great LO too!!! Beautiful! I was looking forward to what people would do with that border stamp set. It’s an interesting one, different from the regular stamps. I like what you’ve done with it! I love this card ! Thanks for sharing !! Ackkkk….I had this stamp set on my wish list (near the bottom) UNTIL….you’re card today…now it’s at the top !! Gorgeous card, girlie !!! I loved your card. I’ve posted mine. Thanks for the challenge! Love this! The colors are so pretty! Gorgeous! One of my all-time favorite color combos, and what a great design! These colours are very striking. Love it! I LOVE it!! The colors are great! Love the Bashful Blue and the Chocolate Chip together…and that teeny flower is the perfect addition. Just beautiful, Beate! I love the soft colors and that half scallop circle peeking out with the oval on top. Love that brown brad-SU needs some of those. great card. What a beautiful card! I love how you layered the punches for the sentiment. Love those colors together. One of my favs! Love the pick for the IC too.